In “The Martian”, botanist astronaut Mark Watney, played by Matt Damon, is presumed dead after a sandstorm on Mars forces the mission to be cancelled and the crew must return to earth, without him or his body. Being alive but wounded he quickly takes care of himself and makes an inventory of what he has food wise and what he has to do to stay alive until the next space mission arrives on Mars four years in the future. Regarding the former he knows there is only a month’s supply but being a botanist he starts working on rationing and possibly growing food with what he has on hand. Though director Ridley Scott has had success with sci-fi pictures such as “Alien”, and this is very much a picture in that genre, it is more a picture of a man’s will to survive in spite of all the odds against him. We follow Mark through a series of video diaries explaining how he grows potatoes using human waste, exploring ways to get in touch with his crew on the way back to earth or the people at NASA monitoring the mission along with fighting the elements. Drew Goddard, who wrote the screenplay based on the book by Andy Weir, has a lot of technical talk to relay to the audience and, truthfully, though I didn’t understand 80-90% of what was being said and/or explained I was able to follow and be intrigued what was going on in the film. 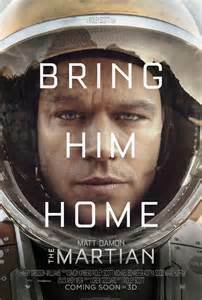 With a strong supporting cast of Jessica Chastain, Kristen Wiig, Jeff Daniels, Sean Bean, Chiwetel Ejiofor, Mackenzie Davis, Kate Mara, Sebastian Stan and a memorable cameo by Donald Glover, strong direction by Scott and many outstanding jobs by the various production personal who will certainly win awards, “The Martian” belongs to Matt Damon. Damon, as Watney, shows the man’s humor, determination to survive, resourcefulness, not to forget his drawing the audience in wondering if he will make it back to earth. He can depreciate himself while at the same time listing his accomplishments as the first person to do many things in space always keeping the viewers on his side and hoping he will succeed. It is this element of doubt that adds a surprising suspense to the story before the end. One quibble is that at 2 hours and 20 minutes “The Martian” is about 20 minutes too long. Oh yes a warning---no, not a spoiler--hope you like disco music along with Abba and Gloria Gaynor! By the way though I saw it in 3D it really isn’t a necessity to appreciating and enjoying this film.